The Stone Roses played their first show together in sixteen years last night (23.05.12). The 'She Bangs the Drums' group played a surprise show - announced only yesterday afternoon - in Warrington, Northern England, to a 1,000 strong crowd. The legendary guitar band - who initially split up after a disastrous festival appearance in 1996 - played an 11 song set, opening with 'I Wanna Be Adored', the first track from their 1989 debut, and closing with 'Love Spreads', from their second and final album 'Second Coming'. 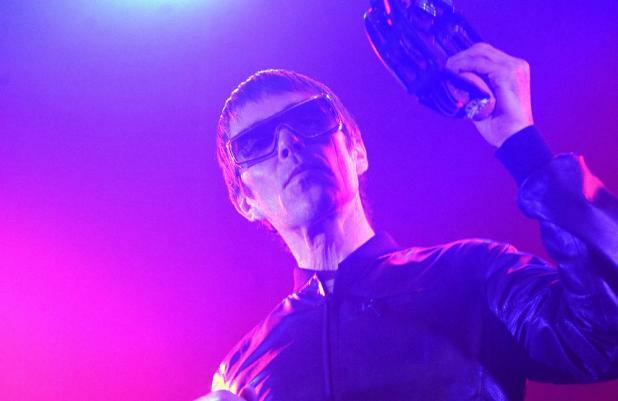 Former Oasis singer Liam Gallagher was in the crowd and excitedly tweeted: "Stone Roses are back. Speechless." The band - singer Ian Brown, guitarist John Squire, bas player Mani and Drummer Reni - were on form, with fans saying Ian's vocals have even improved over time. At one point he urged the crowd to enjoy the show, rather than filming it on their camera phones telling them: "If you put your cameras down you might be able to live in the moment. You have a memory there of something you've never lived." At another point in the set, he quipped: "Are we in tune yet?" before adding: "There's loads of girls in here." At the end of another track, 'Love Spreads', the singer even burst out into a rap, surprising fans. The band will next play in Barcelona, Spain, on June 8 and 9, before playing a handful of European dates before three reunion shows at Heaton Park in their home town, Manchester, from June 30 to July 1.